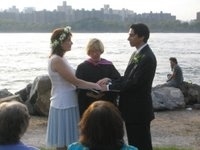 How to Elope (New York information). Should you elope or have the Big Wedding? Should you change your name at marriage? Should you have a religious or a civil wedding ceremony? When should you sign the marriage license?